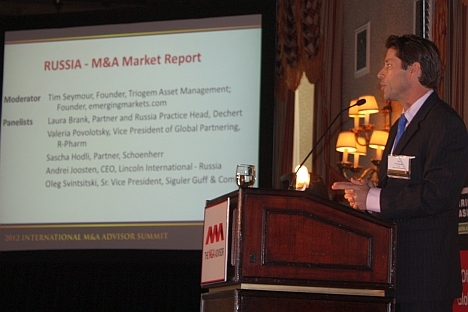 Experts and business community representatives talk on mergers and acquisitions (M&A) activity in Russia during the first International M&A Advisor Summit in New York held in early October.. Despite a substantial slowdown of mergers and acquisitions (M&A) activity in Russia, coupled with a lack of necessary infrastructure and problems such as red tape and corruption, the market remains very promising. That was the opinion of experts and business community representatives who took part in the first International M&A Advisor Summit in New York on Oct. 9–10. “We are here to tell the truth, nothing but the truth,” Tim Seymour, founder and managing partner of Triogem Asset Management and founder of EmergingMoney.com, told the participants at the start of the M&A Advisor Summit’s Russia session. The truth turned out to be this: by August 2012, the total number of M&A deals in Russia had fallen by 35 percent on the year to 716. The statistics, which were cited in the latest DealWatch “BRIC Report,” further revealed that the combined value of all M&A deals in the country almost halved to $51.8 billion. According to Andrei Joosten, CEO of Lincoln International - Russia, the slowdown of cross-border M&A activity in Russia has been caused, in part, by the “effect of uncertainty” surrounding the March 2012 presidential elections, as well the economic situation in the world and in the eurozone, in particular. Joosten believes that there is “a lot of hesitancy from both American and European companies,” which are seeking to minimize their risks as much as possible. “In my opinion, the market is, in many ways, undervalued and underdeveloped,” said senior vice president at Siguler Guff & Co., Oleg Svintsitsky. “But Russia certainly is not lacking in brainpower. There are a great number of paths that the country is now taking; there are plenty of new ideas and intelligent people. I believe this will lead to the establishment of many high-tech companies in Russia that will be strong enough and unique enough to continue developing globally and be interesting to investors,” Svintsitsky said. On the contrary, Joosten thinks that Russian companies have a tendency to overestimate the value of their assets. “Russia is still seen as an emerging market and they (companies) are looking twice before they invest,” Joosten said, addressing the Russia session at the Advisor Summit. According to Laura Brank, partner and head of the Russian Practice at Dechert, many international investors also perceived the recent protest movements in Russia as a sign of “instability,” subsequently putting their activities “on hold.” Other problems specific to Russia include the usual corruption and red tape, as well as imperfect and opaque legislation and law enforcement. Lawyer Sascha Hoedl, a partner of Schoenherr, said that Russia remains “a biased market” for investors. “I think that, while Russia would not be considered an unstable country, it is a country that is governed in a form different from that of the United States,” said David Fergusson, senior managing director of The M&A Advisor, which organized the event. The session participants agreed that the future of Russia’s M&A market lies in high technology. They also noted the efforts of the Russian government that are aimed at creating new high-tech companies via projects such as Skolkovo or Rosnano. “But there must always be some kind of infrastructure,” Svintsitsky said.“For example, internet penetration (which is still not very high in Russia, but soon will be): It means that that the internet and networks attract a whole lot of businesses. And that’s where the future is. E-commerce is an important subject. Russia lacks an amazon.com, and the question is – why? Many have tried. According to the DealWatch “BRIC Report,” M&A activity in the BRIC countries remained stable in the January-August 2012 period, with a total of 3,233 negotiated deals worth nearly $300 billion. Compared to 2011, the largest drop amongst M&A deals in BRIC economies was seen in Russia, where both the volume and value of transactions fell significantly. China was the most active market, accounting for 31.4 percent of all deals and just over 50 percent of their total value. “I think if you ask the leadership of each of the four BRICS countries, they would all work to convince you that they have already emerged. And so, I think this definition of ‘emerging markets’ is one of convenience: it helps professionals capsulize a particular group of markets for ease of discussion,” said Fergusson. “There is an obvious need for infrastructure development in countries such as China and Brazil, in order to manage the growth that they are experiencing." The session participants also pointed out the fact that Russian companies have become much more active in the global M&A market. “We are very much looking forward to coming to Russia to share our experience and knowledge and to make connections between Russian and American deal-makers,” Fergusson said. The two-day summit in New York may well have been a good starting point for those who share Fergusson’s aspirations.